What if you could secure every user across your SD-WAN fabric in minutes? Cloud-delivered WAN architecture that enables digital and cloud transformation. Cloud-delivered secure internet gateway that provides the first line of defense against threats on the internet. 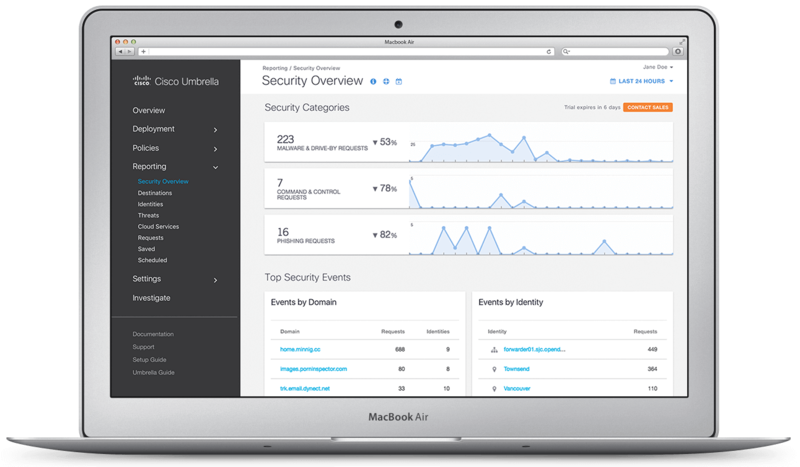 Quickly deploy Umbrella across your Cisco SD-WAN to hundreds of devices with a few simple clicks. Your users will be protected against threats such as malware, ransomware, & C2 callbacks with no added latency. Copy the network API key from Umbrella into the Cisco SD-WAN vManage console Umbrella API registration field. Apply Umbrella DNS re-direct policies in vManage. You can apply policies and view reports on a per-VPN basis. If you’re new to Umbrella, create policies for your organization. The Umbrella policy wizard walks you through each step.